What types of services does Charleston Center provide? For a list of Charleston Center Programs and Services, please CLICK HERE. A clinical assessment is an interview to gather information to help determine your needs and the severity of your problem. The assessment information helps us provide you with the best treatment for your unique needs. Determine your diagnosis - There are a range of diagnoses that may be appropriate for the types of patients that we see and we need to identify the appropriate diagnosis for you, just as a medical doctor diagnoses a medical problem. Determine the most appropriate type of treatment - We offer several different levels of care and types of treatment and we need to determine which is best-suited for you. The assessment is the first step in your treatment and it is the foundation for its success. Important decisions about your treatment are based on your assessment. This is why it important that you provide as much information as possible and that you provide accurate information during the assessment. What are Charleston Center's clinical assessment hours? Charleston Center offers walk-in assessments for Outpatient Services during the following times. If you are unable to arrive during the walk-in assessment times, please call us at (843) 722-0100 to schedule an appointment. Do I need a referral to enter services at Charleston Center? No, a referral is not required to enter services at Charleston Center. We will, however, work with other providers to coordinate care at the patients' request. A signed Release of Information form is required. 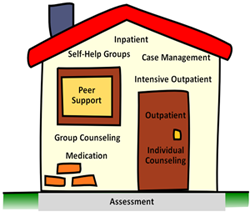 What types of treatment does Charleston Center provide? What medications does Charleston Center use in the course of treatment? Charleston Center uses a variety of interventions to help work through any withdrawal symptoms an individual may experience. At other times, medications may be used to help support recovery. Medication options will be determined and discussed through the treatment planning process. How do I commit someone to treatment? If you are concerned about a family member's excessive alcohol or drug use, unwillingness to seek help and you worry that they are a danger to themselves or others, we can assist you in committing them to treatment. Please call (843) 722-0100 or walk-in during regular business hours. We will assist you in completing and submitting the appropriate paperwork at no charge. What types of payment methods does Charleston Center accept? Charleston Center accepts cash, checks, money orders, cashier checks and major credit cards (Visa and Mastercard). We will work with you to establish a reasonable payment plan. Individual arrangements for payment plans can be made at initial intake, or as financial conditions change. Private insurance and Medicaid are also accepted and billed on your behalf. At this time, Charleston Center does not accept Medicare as a form of payment. Can I enroll in services if I do not have any money? Yes. We provide services regardless of a person's ability to pay. At your request, a full financial assessment can be completed at intake to determine ability to pay. Ability to pay is assessed based on the Federal Poverty Guidelines. How much does it cost for an clinical assessment? Charleston Center currently charges a flat fee for a clinical assessment. The fee schedule will be discussed at intake and payment arrangements will be made. How much does it cost for Withdrawal Management? Costs vary depending on length of stay and level of care. Length of stay varies from 2-10 days based on individual assessment. We accept Medicaid and private insurance, or will work with you to establish a payment plan. To access an online application, CLICK HERE. For information on fees and registration times, please call the ADSAP Information Line at (843) 958-3410. A copy of your driving record can be obtained through any local South Carolina Department of Motor Vehicles (SCDMV) office. For a complete list of SC DMV office locations, CLICK HERE. How many days does my driving record need to be date stamped? Your driving record should be stamped within 30 days of ADSAP registration. Will the courts be notified that I have registered for ADSAP in order to get a restricted license if I am eligible? A copy of your ADSAP enrollment form is sent to the South Carolina State Department of Motor Vehicles (SCSDMV) office in Columbia, South Carolina. If eligible, SCSDMV would issue a restricted license. Should I enroll in ADSAP? If you are seeking to regain your driver's license or boating privileges after convicted of Driving or Boating Under the Influence, Implied Consent, Unlawful Alcohol Concentration of a .15% or Greater and Zero Tolerance (Under the age of 21with a BAC of .02% or Greater) you are eligible to enroll into ADSAP. If you were charged but not convicted under the Administrative License Revocation Process and have requested an administrative hearing with the South Carolina Department of Motor Vehicle to contest the charge(s), you aren't eligible to enroll. If you waived your rights to an administrative hearing, you are eligible to enroll. When should I enroll in ADSAP? It is important to enroll immediately after receiving notification that you must successfully complete this program. Offenders must enroll within 30 days of conviction. The court of jurisdiction will be notified if an offender fails to enroll in the program within 30 days or fails to participate in the plan of education or treatment. The court may hold the individual in contempt of court if the offender can't show cause as to why enrollment did not occur within the mandated 30 days or why no progress has been made on the plan of education or treatment. The DMV will not reinstate your driver's license or special privilege until it is notified of your enrollment and/or successful completion of ADSAP. When and where is ADSAP enrollment? As of 8/5/2013, Intake to the ADSAP program will take place on a walk-in basis Monday thru Thursday from 8:30 a.m. - 2:00 p.m. Expect to be here for up to 3 hours. For directions to Charleston Center, click here. Is there a cost for ADSAP? Yes, the fee for ADSAP educational services provided is $500.00. If you are assessed as requiring treatment services the cost can increase to $2,000.00. The total cost of all services - educational and treatment combined will not exceed $2,500.00. How long does the ADSAP program last? Services are based on individual needs; therefore, the time period to complete ADSAP varies for each person. While most people complete the program by the end of their suspension period, treatment could take up to 12 months (1 year). Please note that inconsistent attendance at scheduled ADSAP program activities can result in an unsuccessful discharge from services. What do I need to bring at the enrollment? In order to enroll in ADSAP, offenders are asked to bring a 10 year official copy of your driver license record, a photo ID and $500.00 deposit toward the program. May I drive while I am participating in ADSAP? If this is a first offense DUI and certain requirements are met, you may obtain a provisional driver's license from the DMV. This provisional license is valid for six months from the date of issue contingent upon successful participation in ADSAP. First-time and repeat offenders who do not qualify for a provisional license may qualify for other restricted license as determined by the DMV. Where is Charleston Center located? Charleston Center is located at 5 Charleston Center Drive in downtown Charleston. For directions to Charleston Center, click here. For further information regarding the ADSAP program, please contact (843)958-3452.